The Basilica of Notre Dame at Brebieres at Albert, a town in the Somme region. The gold Mary and Jesus at its pinnacle was first hit by a shell on January 15, 1915 and it fell in March 1918. It was the first day of the German spring offensive. The date was March 21, 1918 and the Kaiser’s boys were launching Operation Michael, an audacious bid to puncture Allied lines and seize the Channel ports that lay beyond. If they achieved that aim, Britain would be bracing itself for invasion. The crucible was the heavily fortified Hindenburg Line. This 90 mile scar running across the face of France marked the Western Front and was named after the Field Marshall Paul von Hindenburg. Ground Zero was the San Quentin Canal. 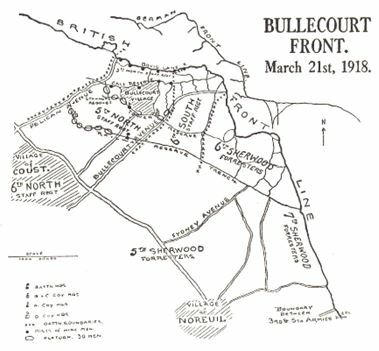 On that day, a 20 year old from Tamworth was stationed in Bullecourt, a short distance from the front line. He was a soldier in the 5th North Staffordshire Regiment. Horace Hollingsworth was in his fourth year of fighting. 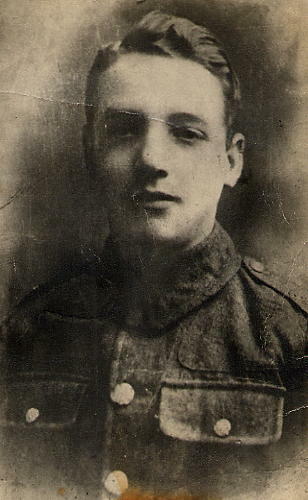 He’d joined the army in peacetime, shortly after his 16th birthday in May 1914. And then, just over a month later, a Bosnian Serb named Gavrilo Princip shot dead Archduke Ferdinand and Sophie, Duchess of Hohenburg, in their car in a narrow street in Sarajevo. Princip wanted a Bosnia free of the ruling Austro-Hungarian Empire. With the empire’s heir presumptive dead, aggression followed aggression and by the first week of August, after Germany had attacked France through Belgium, Britain was in a retaliatory spirit. For Horace, a month after leaving work at a colliery and starting his second job in the army, he’d found himself staring down into the industrial killing machine of World War One. Operation Michael was the first offensive of Kaiserschlacht and took place on the Somme. Two years earlier, in the summer of 1916, the region named after the local river had, on just one day, acted as a graveyard for more than 20,000 British troops. July 1, 1916 deservedly takes its title as the worst day in British history. Not just British military history. That’s 20,000 sons, brothers, uncles and fathers wiped out in one single stretch of 24 hours. Horace had witnessed the carnage and lived to tell the tale. (Over the following years his body would sweat shrapnel). 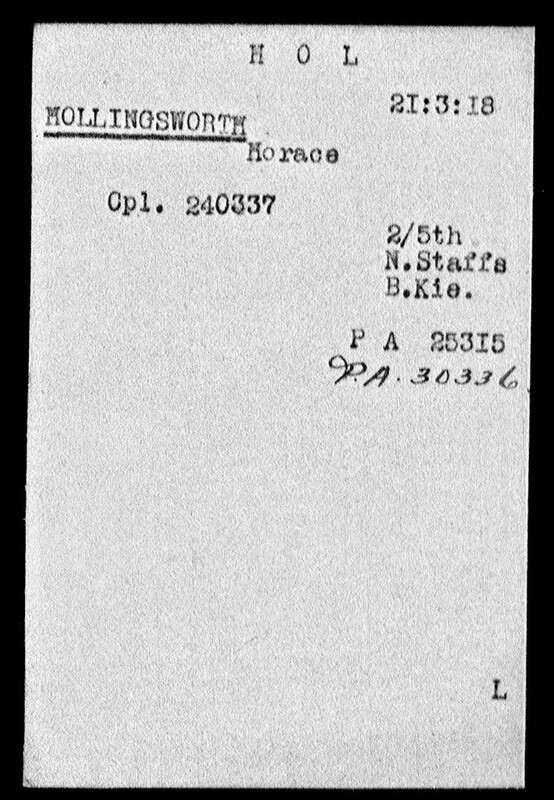 Horace was in the 2/5th battalion, which was formed at Hanley, a town of Stoke on Trent, on November 1, 1914. Hanley is in Staffordshire in the West Midlands. March 21st, 1918 is classified as the second worst day in British military history after the bloodbath of the Somme. Why? On that day the Allies took 38,500 casualties, including 8,000 dead. The offensive along the Western Front pressed on until April 5, and saw the Germans gain more ground in those few days than our boys had since 1914. They captured some 1,200 square miles compared to the 125 square miles taken by the British in 141 days during the Battle of the Somme. Among the casualties, 21,000 British soldiers were taken prisoner. Of those men, one was Horace. My great grandfather. The German bombardment – one of the heaviest artillery bombardments in history – began at 4.40am on March 21st and lasted five hours, raining down 3.5 million shells on British and Allied positions. During the 16 days of Operation Michael, an incredible 37,000 Allied service personnel were killed, of that number 23,000 are without a grave. This Sunday, me and my chums will make our annual pilgrimage to the battlefields of France and Belgium. This year we’re going to Bullecourt. Every year, we meet up when the weather turns good and take the Eurostar to the Continent where we follow in the footsteps of the boys and men of the Leicestershire Regiment. This year is extra special as it’s the centenary of the signing of WW1’s armistice in a railway carriage in Compiegne. It’s also 100 years since the incredible storming of the San Quentin Canal by our brilliant boys in the 48th North Midland Division. To mark the occasion, there will be a BBC Radio programme of our visit. BBC Radio Leicester’s Ben Jackson always sends fresh reports as they happen back to Leicester. This year, however, it’s going to be a bit more special. We’re even bringing a producer. We will be stationed in Albert, a place of which we’re very fond. We’ll be visiting Amiens, the home of the writer Jules Verne. Among many brilliant cerebral voyages, he is credited with predicting the use of gas as a deadly weapon (Mustard gas first used at Passchendaele in 1917) in his book The Begum’s Fortune in 1879. The book centres around two cousins, one German, one French, who inherit 500 million Francs. The Frenchman chooses to build a world of peace with his largesse, the German builds an industrial city based on weapons manufacture. The German also vows to destroy his soft cousin and take over the world. Stop me if you think that you’ve heard this one before. 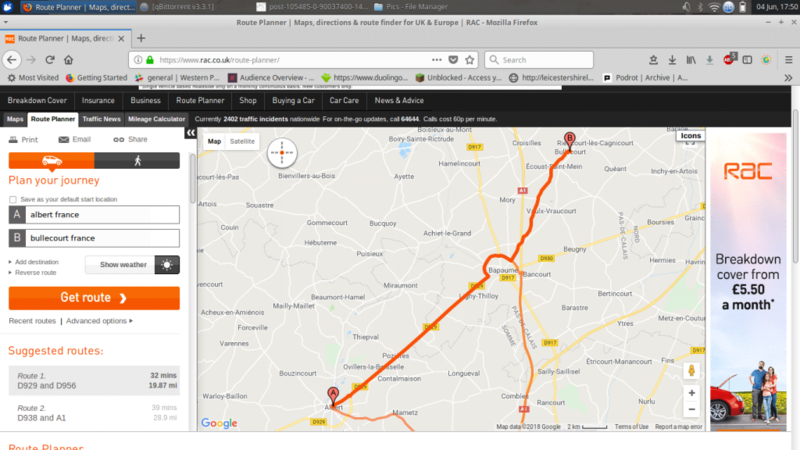 From the map below, you can see we’re not far from Bullecourt, the frontline village where Horace was captured. You can taste the chaos on the day he was seized in Col HC Wylly’s 1st and 2nd BTTNS, The Leicestershire Regiment in The Great War. The next few pages chart a descent into battle and chaos. Ranks of German soldiers appeared to be advancing by the Noreuil Valley on the left, the Lagnicourt Valley in the centre and the Morchies Valley on the right. Just before 8am the Brigade learned enemy troops were concentrating on Cornhill Valley. These were the men of the 195th German Infantry Division. They were up against the 71st Infantry Brigade, which contained the 1st Leicestershire, Norfolks, Sherwood Foresters and the 509th Field Company, who were holding the position with help from the 11th Leicestershire (Pioneers). 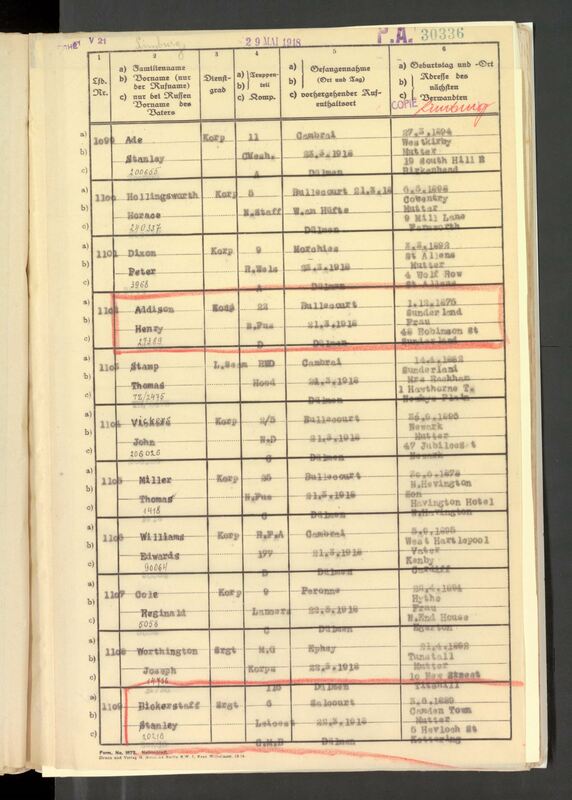 Earlier a company of the 2nd South Lancashire of the 25th Division had been added to the left of the Brigade line. The Germans made steady progress, advancing rapidly as the losses mounted, officers called for reinforcements, and the Germans broke through weakly held lines. As they swept through and the gunfire increased in intensity, by 3pm the German infantry had thundered through Lagnicourt-Maricourt Wood road and Vaulx Wood. B and C Companies of the 11th “were practically destroyed in this advance”. The next roll call for the men of Leicestershire, Norfolk and Nottinghamshire was forlornly punctuated by the words Missing, Wounded, Killed. By sunrise, the 9th Norfolk, 1st Leicestershire and 2nd Sherwood Foresters had only 160 men left standing. The 6th Division casualties between March 21st and 23rd was 3,900 out of 5,000 engaged. On the morning of the 23rd, the 71st Infantry Brigade was down to 11 officers and 279 non-commissioned officers and men. Their trench strength on the morning of the 21st had been 1,800 all ranks. Right, there’s packing to do. Photos and words to follow when we return.